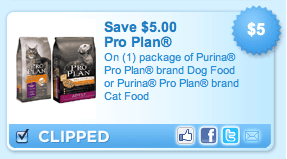 Or, grab this coupon for $3.00 off any one bag of Purina Pro Plan Dog Food. Meijer has a meal box coupon for $2 Off Any One (1) Package of Purina ONE SmartBlend Dry Dog or Cat Food. Any Size, Any Variety (scroll to the bottom of the list). If you stack a Manufacturer’s Coupon with a Meijer Mealbox Coupon you should be able to get some pretty cheap dog food. If you wait for a sale you might even get a FREE bag of Dog Food. Stack: To use more than one coupon on a single item. Meijer allow customers to stack a store coupon and a manufacturer’s coupon. Previous post: FREE Chavrie Goat Cheese & FREE copy of For The Love of Goat Cheese from Chavrie.